Commonly, there are three ways to extract essential oils from plants. Parts of plants, such as the skins of citrus, lend themselves to a process of cold pressing. Other substances may be extracted from the plant by the use of solvents. For the most common oils, a steam distillation method is used. Water or steam distillation is one of the oldest processes of extraction, or separation, of organic substances, brought by the Arabs in the ninth century. This technique was already known by the ancient Greeks, and probably dates back to the Egyptians, around 3500 BC. It is accomplished in a distillation apparatus . The method is based on the existence of an azeotrope having a boiling point lower than the boiling points of the two pure compounds taken separately. The goal is to draw with steam the volatile components of the crude products. The steam destroys the structure of the plant cells, and releases the molecules contained. It then catches the more volatile ones, separating them from the cellulosic substrate. The steam charged with the essence of the distilled raw material condenses in the coil before it is recovered in a still receiver. The insolubles in the condensate are decanted to obtain the supernatant oil (or essential oil). The part containing the water soluble compounds is called herbal distillate (or hydrosol) . The manufacturer then collects a mixture of defined composition of the two products. Compared to the first distillations, little progress has been made to increase the amount of oil collected, compared with the huge quantities of plants needed for its extraction. However, laboratory methods are now used allowing to control the quality of the oil produced and its exact composition in active ingredients. 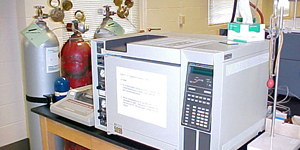 The most often cited method is gas chromatography used to separate different molecules present in the oil, to then enable their identification by mass spectrometry.